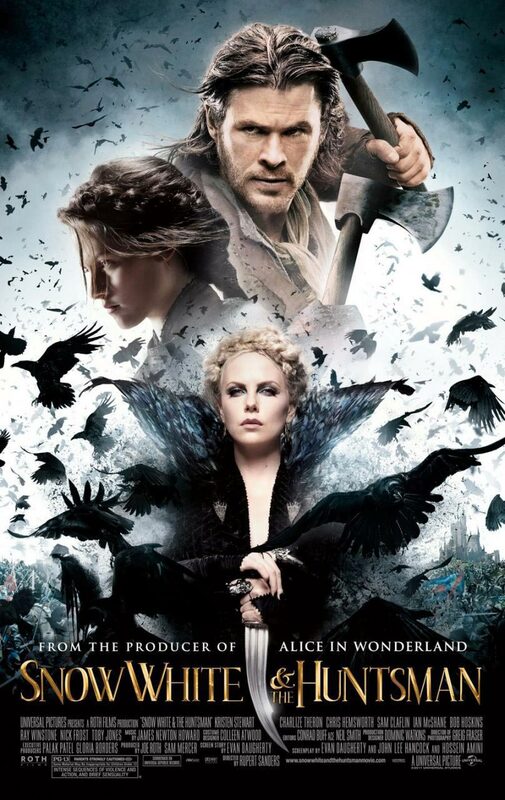 Snow White and the Huntsman, an anticipated rendition of the fairytale we all know and love, finally came to theatres June 1st! Like many others, I was immediately drawn to this seemingly dark version of the beloved tale as well as the wonderful cast, but I was also looking forward to the cinematography and film score. So, my expectations were high. And I must say, I wasn't let down. Oh, I do love a good revolution! This rendition of Snow White is dark, but it still keeps a fairytale vibe. There's still magic, both good and evil, and the difference between the two leaves a beautiful and distinct contrast. Most of this has to do with this film's cinematography. As I previously mentioned, this was an element I was really looking forward to. Right off the bat, my expectations were met. Even the battle scenes contained beauty with the way the effects were brought about, which is a bit unusual. Above all, the most potent way the cinematography is displayed is in the general setting. Nature is taken to a new level of fantasy in this film, and depending on when it is used (as much of the film takes place outdoors), it can be the darkest or the most innocent form of creativity. This contrast is most evident when comparing the Dark Forest (which is so much scarier in this film) to calm and bright Sanctuary. As far as my other pre-viewing expectations, I expected a great score. James Newton Howard did the film score, which immediately made me excited since I enjoyed a lot of his previous work for films. In Snow White and the Huntsman, the score was consistently effective and epic. I'm pretty sure I had that figured out within the first minute. The film in general started out semi-corny, but not quite. It was getting close, but once things really started to take off, it was a far cry from even semi-corny. Snow White and the Huntsman was not a boring film; I was engaged throughout. Charlize made a frightening evil queen, and the queen's brother kind of freaked me out. Well, I guess his character in general didn't effect me much. It was their relationship. It confused me... It seemed they were a little bit closer than that, but there wasn't anything too obvious for me to think that. Just bits and pieces. I guess I was almost waiting for a backstory that concerned both of them. Kristen Stewart did a good job with her role, if I may say so myself. Stewart seems to get a lot of harsh criticism, and part of the reason is because of her performances in the Twilight films. (Personally, I don't understand how anyone could stop ranting about the scripts of those films to even begin talking about the actors...) Honestly, I like Kristen. Twilight's the worst she's ever done (and I don't give her all of the blame for that anyway) but other than that, I have no problems with her. The role of Snow White was a really unique one for her and I think she did it right. Until this film, I've never seen her portraying a character so innocent and in-touch with nature... Nor have I ever seen her as a battling badass. It was all quite interesting to watch! Still, I must say that Chris Hemsworth took up a lot of spotlight in this movie. Let's face it, he's fun to look at. But that's not to say that he's not a good actor, because he really is. I really felt for the Huntsman and loved to see his character grow. In fact, the Huntsman is easily my favorite character. One thing about this new take on Snow White that left a positive mark on me is how Snow White is much more femminist. Obviously, she can't do everything by herself, but she does fight. She doesn't just sit around waiting, she encourages an army to fight with her in her quest to overthrow the queen. Of course, this made for an awesome final battle. Throughout the film, Snow White has two possible love interests. (This part of the plot isn't examined thoroughly, so don't confuse this for some romance flick.) I could see this going either way, and it even got to the point where I was expecting one of them to die so she'd hurry up and make an obvious choice. Which brings me to the ending: I love how she made her choice in a clear way without saying a word. She barely even moved. It was an August Rush sort of ending - we knew how that part of the story would play out, the writers knew we knew that, so they didn't show us a corny scene that wraps up the all-too-careful happily ever after. This made me so happy, and I became even more delighted when I saw the epic credits... Am I the only one who really loves to see effects in the credits? Anyway, the ending was perfect. Overall, Snow White and the Huntsman was a fun yet dark film. I enjoyed it vastly and believe that many others will as well, with its light moments with the dwarves, moving moments with Chris Hemsworth, and its epic battles that are bound to just about every character.